Nowadays I am all about them cookies! And if they are healthy then sign me up for a trial please! !Today I have for you Chocolate Chip Buckwheat cookies. These cookies along with my Healthy Double Chocolate Chip Ragi Cookies and Healthy Peanut Butter Cookies are my goto recipes for healthy everyday cookies. So what is Buckwheat?What is buckwheat flour made of? Does it sound fancy and super healthy to you?Like this amazing cure all flour that’s been touted by all those sophisticated gourmands and health gurus?That’s suddenly become so popular that you go in search for it in speciality stores and buy it only to google it and see that’s its Kuttu ka aata that your mom and grandparents have been eating all their lives?You know those special Navratri slightly dark puris which your mom made only during the fasts?They are made from buckwheat or kuttu aata. It’s almost chia seeds deja vu!When it become the hip and healthy thing to eat,you went and told your mom about including it in her diet but instead of “oh wows” , she raps you on your head and says you have been eating your weight in chia seeds since you started solids.Yes you have.. In your faloodas and kulfis. Yeah it’s like that.Buckwheat is the cooler hippier name for kuttu ka aata. These cookies are nutty, crunchy from the outside and soft inside. The recipe is adapted from David Lebovitz buckwheat cookies recipe.Baking with buckwheat can be challenging if used in isolation thats the reason it has to be mixed with another kind of flour.I have used our everyday use wheat flour instead of all purpose in making these.I have also used whole eggs instead of just the yolks for the recipe plus some smaller changes in the quantity of chocolate chips and types of nuts etc. Read the note below the recipe if you are making these for your babies. 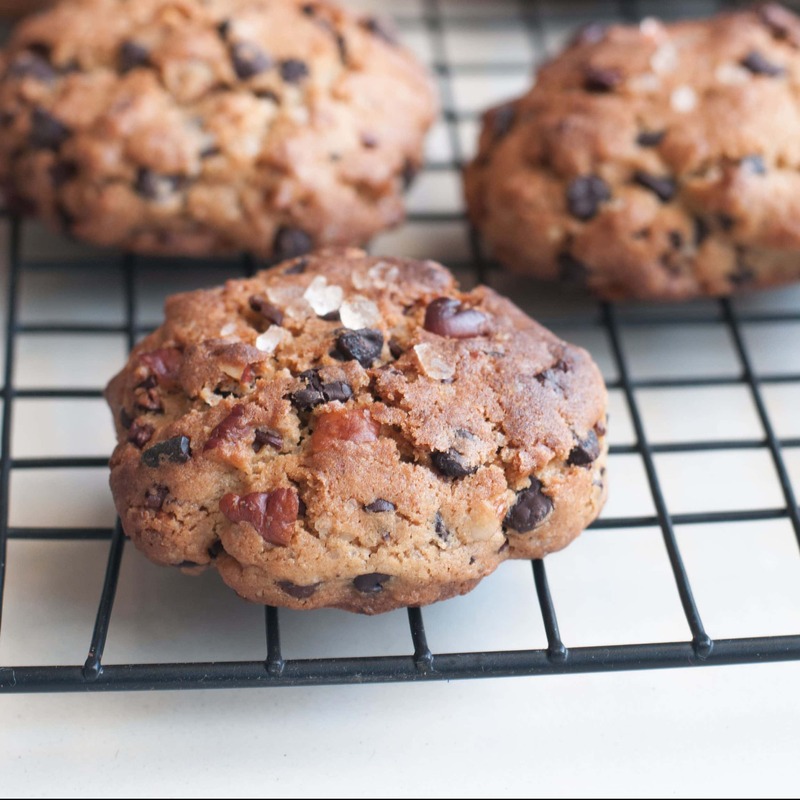 Healthy Chocolate Chip Almond Buckwheat Cookies. Mix the buckwheat flour, wheat flour, baking soda, salt and baking powder in a large bowl. Melt the butter.Add the sugar and whisk well. Add the eggs and the vanilla paste to the sugar and butter mixture.Combine with a spatula. Pour the liquid in the flour mix and combine to form a dough. Using a ice-cream Scoop ,scoop the cookie dough on a prepared butter paper lined baking sheet. Bake for 12 minutes at 180 degrees.Let them cool in the pan for 10 minutes before transferring them to the wire rack. Cool completely and store in an airtight jar up to a week. -If the dough seems too loose to you then put it in the fridge for 1-2 hours.If it still looks too loose then add some more wheat flour to it. -The cookies are cooked when the sides are slightly brown. -You can sprinkle some sea salt on them before baking if you like. I am working on substituting the refined sugar with jaggery and I will update the blog as soon as I have a workable solution.Last time I substituted the sugar with the jaggery I ended up with the cookies melting into each other and made bars instead of cookies. Update-The refined sugar can be substituted with jaggery which can be melted along with the butter in the microwave and added to the batter making these Buckwheat Cookies Healthy.As jaggery tends to turn liquid the amount of flour will need to be increased so add another 1/4 cup of buckwheat flour to it. If making these cookies for babies I suggest you skip the chocolate and the nuts.Also use jaggery/palm sugar instead of refined sugar.Substitute the brown and white refined sugar for 1/4 cup Jaggery.It should be melted along with the butter.Add 1/4 cup more flour cause addition of the jaggery will make the batter a little wet. If you are new to baking then you can read my post on How to Start Baking so that you can make these healthy yummy treats too.